The cat eye flick is an iconic beauty look that has garnered the attention of leading ladies from Cleopatra to Twiggy to Lauren Conrad. This flirty little liner trick isn’t the easiest to pull off, but it’s one that every girl should have in her makeup repertoire. It’s classic and timeless, which means that it will likely never go out of style, and once you learn how to master it, you’ll keep going back to it again and again. The cat eye is also extremely versatile. You can wear a subtler flick throughout the day, or make it more dramatic for a night out. You can also create a flick that suits your style and personality. Audrey Hepburn and Dita Von Tesse are both accustomed to the cat eye, although very different women. Hepburn personalized hers to play up her doe eyed innocence, while Von Tesse’s playful tips paint her as the femme fatale she is. However you want to rock it, read on to learn how to get the perfect cat eye in five easy steps. Prime your eyelid with a base coat primer (we swear by Urban Decay Eyeshadow Primer Potion). This will ensure your cat eye stays intact throughout the day (or night). Look down to ensure you have a smooth surface to draw on, then draw an angled line out and up from the corner of your eye with your liner. You can also use a piece of tape to create the line the first few times so you can get use to it and figure out the angle you’re looking for. Create a triangle shape connecting the top of your wing tip to your eyelid (it should reach the outside of your iris). Fill in the empty triangle shape with your liner to create the winged look. Make sure your layer it on enough so that it’s filled and smooth. Apply top liner as you normally would, having it thicker where the triangle meets the eyelid and thinner as you get closer to the inside of your eye. Touch up any mistakes that you made throughout the process with a q-tip and makeup remover. Not sure which eyeliner to use when trying out these tips for the perfect cat eye? There are heaps of different options to choose from, but we swear by Maybelline New York Eye Studio Lasting Drama Gel Eyeliner. It’s dark and dramatic, goes on smooth, and lasts all day long. 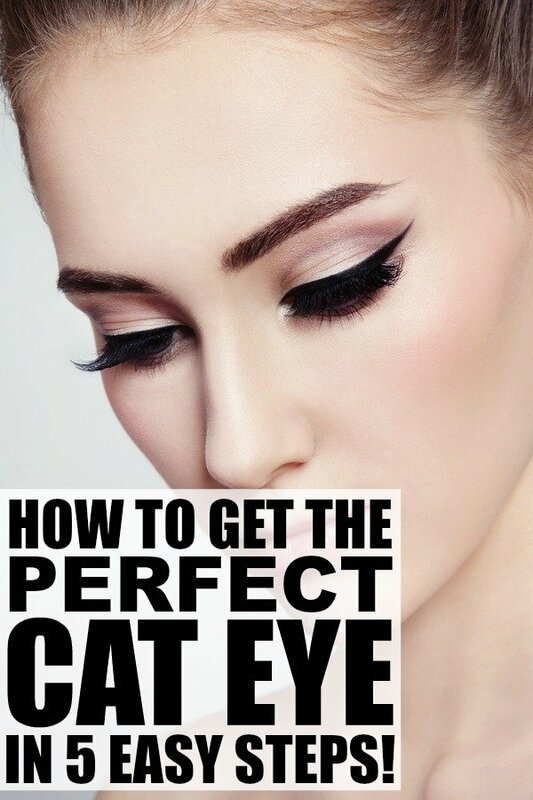 If you found these tips for getting the perfect cat eye helpful, please share them on Pinterest! And if you’re looking for more makeup tips and tricks, please follow our Beauty board where we share all kinds of new trends and how-tos!